The Holy family with the young St John the Baptist. Recently identified, this is an important addition not just to the exiguous oeuvre of Giovanni Cambiaso, father and teacher of the celebrated late Mannerist Luca. It embodies a critical transition in the development of Genoese painting, from the importation of stylistically advanced works through the first half of the sixteenth century, to the assertion of a distinctive indigenous style––the foundation of a major regional school––in the second half. The painting’s references to earlier works by leading forestieri are several. Most conspicuous is the debt to Perino del Vaga, who worked in Genoa from shortly after the Sack of Rome until around 1538. In compressed composition, stylized refinement, a palette slipping from primary, and the wide range of paint handling, the group of the Virgin and Child recalls Perino’s numerous interpretations of the subject, most closely those in the Musée Condé at Chantilly and the Museo Nazionale di San Matteo at Pisa. 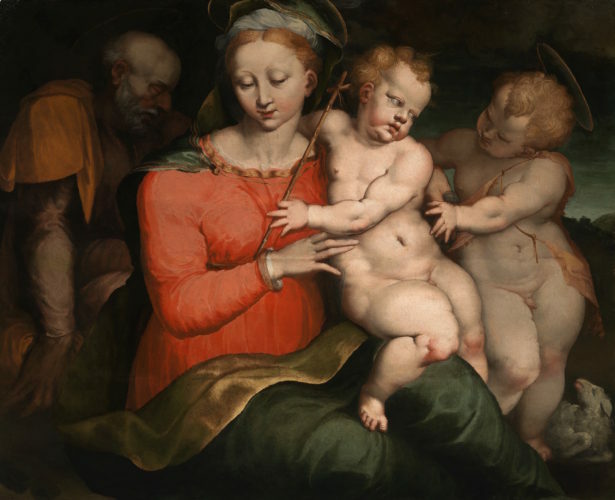 However, Perino’s sharp fracture and remote affect have been softened according to more recent examples, notably the Holy Family with the Young Saint John the Baptist usually attributed to Siciolante da Sermoneta that reached the Santuario della Coronata at Genoa-Cornegliano in 1547. At the same time, the disconcerting proportions and harsh modeling of the Christ Child evidence an interest in Michelangesque examples that were known through engravings if not other paintings. In this ambitious though incompletely resolved combination of elements, the Virgin and Child closely resembles the same group in one of Giovanni’s few reasonably preserved paintings: the altarpiece for the church of Santi Giacomo e Filippo at Taggia, again dated around 1547. Their style characterizes Genoese painting on the threshold of a new age. The other elements of the present work carry it over that threshold. The figures of John the Baptist and Saint Joseph are manifestly different in character and ultimately quality. First, simply, the boundaries between these figures and the central group are well defined, crossed only at the tip of John’s curiously arrayed (and expressly adjusted) fingers. His posture is an overt rhyme with that of the Christ Child, but the regularity and foreshortening of his head are more daring and accomplished than any passage in the Virgin and Child. Just as striking is the half-light, causing the figure to recede without diminishing presence, moreover its modulation, approaching that of Parmigianino’s in subtlety of action and equilibration with the shape of the head. Practically separate in the composition and immersed in a nocturne, Joseph appears an even more discrete element. Both figures are handled with a more consistent touch than in the Virgin and Child––a touch that is broader, swifter, and comparing the treatment of hair in the two children, naturally modeling of form. This concept and execution are those of Luca Cambiaso, not at the very beginning of his career but around 1550, just as he was reckoning with current Michelangesque painting and beginning to temper an adolescent extravagance. The Adoration of the Magi in the Pinacoteca Sabuada at Turin is a masterpiece of this stage. Comparing that painting and this underscores Giovanni’s responsibility for the Virgin and Child, Luca’s for the young Baptist and Joseph. Like most of Giovanni’s later works and Luca’s early ones, the present work is a collaboration. Somewhat more advanced in date and much better in condition than many, it represents a watershed in the development of Genoese painting. Mr Jonathan Bobber (National gallery of Art Washington).